Home Match Our Spurs team to face Everton – What’s yours? 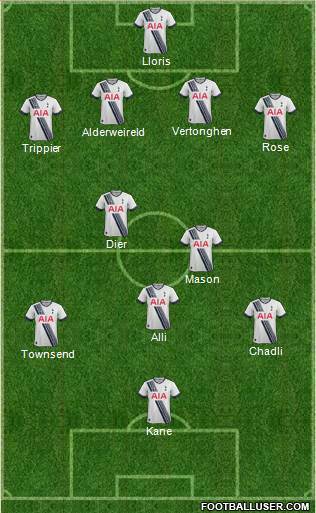 Our Spurs team to face Everton – What’s yours? This is a match where the manager earns his money. Mauricio Pochettino is without his playmaker Christian Eriksen and it seems a little early to hope that new signings Clinton Njie and Heung-Min Son can play. What’s more, Erik Lamela seems to be on the verge of a move to Inter Milan and is unlikely to feature. Pochettino doesn’t have a huge group of players to choose from and we’d like to see him give some chances to a few fringe players in the squad. In goal Hugo Lloris will start again but in front of we’d like two new full-backs to com in alongside Toby Alderweireld and Jan Vertonghen. The team has missed the attacking thrust of Danny Rose on the left and if he returns it would seem the right time to give Kieran Trippier a start, to provide ammunition from the right. In midfield we’d keep faith with Eric Dier and Ryan Mason but in front of them there needs to be changes. The likes of Tom Carroll or Alex Pritchard are in the frame to replace Eriksen but we’d go with Dele Alli who scored his first goal for the club in the 1-1 draw with Leicester. Nacer Chadli will start on the left. On the right we’d like to see Andros Townsend come in if he’s fit enough. Mousa Dembele has done OK on the right but his presence has contributed to the attacking midfield trio being painfully slow this season. Up front there is no decision to be made as Harry Kane remains the only available at the club. Here’s our Spurs team to face Everton, what’s yours? Same as I said last week, anybody but Lamela!! Love to see this formation but PM would never to bold enough to make make so many changes. First post of the day. Love to see this formation but PM would never be bold enough to make so many changes. It doesn’t make sense to play Townsend when Pritchard is so much better. Also Vertonghen has been poor, so it is time to pick Wimmer. If Son was eligible, he would be in instead of Chadli. If Poch plays Walker again I’ll give up and turn to rugby. No lamela field or bench,just get him out. Would put dembele on cam,mason on bench, townssnd playying right and alli playing mid.